Earlier in the week I kept checking the forecast - as I normally do, as our weather is very changeable. I noticed that we were going to have a dramatic change in the temperature (we had been having 80-85F) over the weekend - it was going to drop to the 60's F. In fact, I thought, "Why don't you plan on getting some quilting done?" I'm really behind in the number of tops I have quilted - I don't know how many I have left, but I literally ran out of cool weather before I finished up most of my tops from last year's piecing binge. 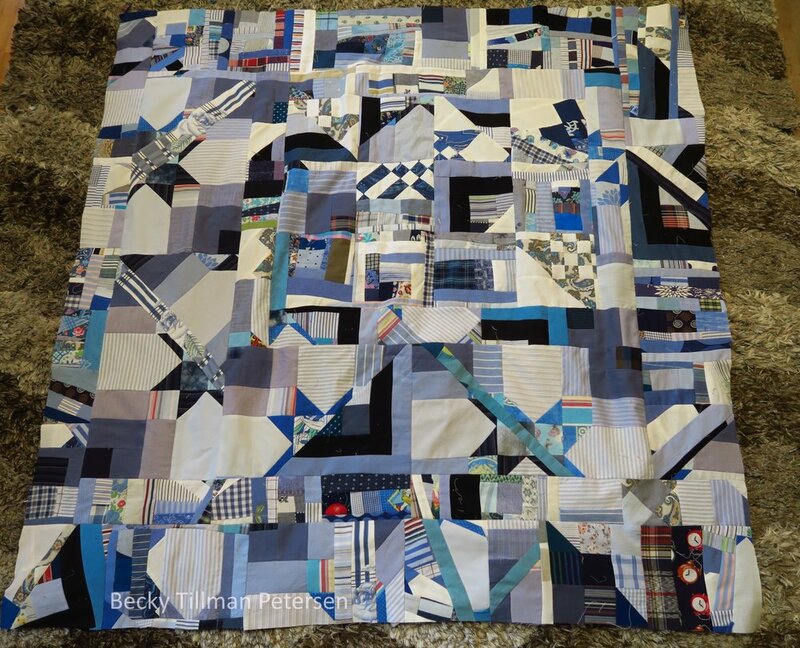 So instead of working on my strings project for the weekend, I've been trying to use these cooler days for quilting - to finish up at least 4 quilts was my goal - as I had 4 cool days on the forecast. So, before the weekend, when the weather was so hot, i decided to work on some strings/crumbs projects to kind of make up for it and to keep making progress with these quilts! I don't really like getting so far behind - but it is just too hard to quilt when it's over 80F in my sewing room! So I did make up some more crumbs pieces - with the goal of adding to "A Hot Mess". Unfortunately, I didn't get any strips added to the top, so it remains the same size. I did more, but I have things spread out in my sewing room with the quilting so I couldn't find my other crumbs pieces in a second. I did find these two, however. I know I have quite a few more - as these were pretty quick to make and I spent at least an hour on it. I'm posting a picture of the top A Hot Mess as it was at the end of last week. Sadly it is still the same size. But I did make 10 more strings blocks, so I can go ahead and work on the strings 3. I had made some blocks the wrong way last time - not paying attention to the direction of the HST so I needed to make up more so I can make more hourglass blocks. If feels like this top seems to be taking forever to get done. I know I could finish it up quickly if I just put my mind to it - I guess my heart hasn't been in it. But I keep plugging away, taking baby steps. I didn't actually do any of it over the weekend. I've been engulfed in quilting. Seriously so. And guess what? I'm starting to actually enjoy it! I switched to using my 12000 to quilt with and it is so trouble free, I think it is making a huge difference in my enjoymenet level! Here's a glimpse... Hopefully sooner rather than later I'll have a few more finished quilts to show you. Most of them aren't being quilted this heavily! Don't forget to check out what my sis has for you in the store! Some things she has in 1 yard pieces, some she sells by yardage. Be sure to check out the site!